Our readers love a good pasta salad and how could they not with all those yummy carbs! 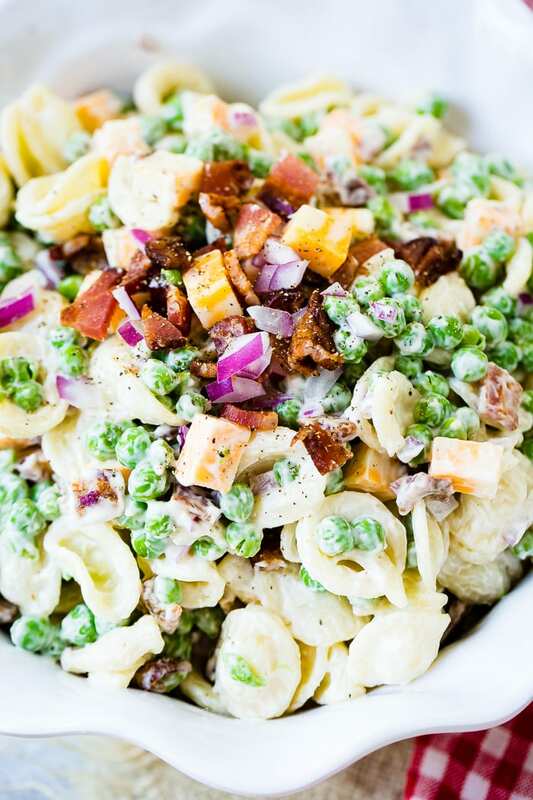 We took our favorite pea salad and turned it into an Easy Southern English Pea Pasta Salad. We’ve chatted before about our love for BBQs and potlucks with friends and family, but as much as the company matters to us, we all know the food is just as important. 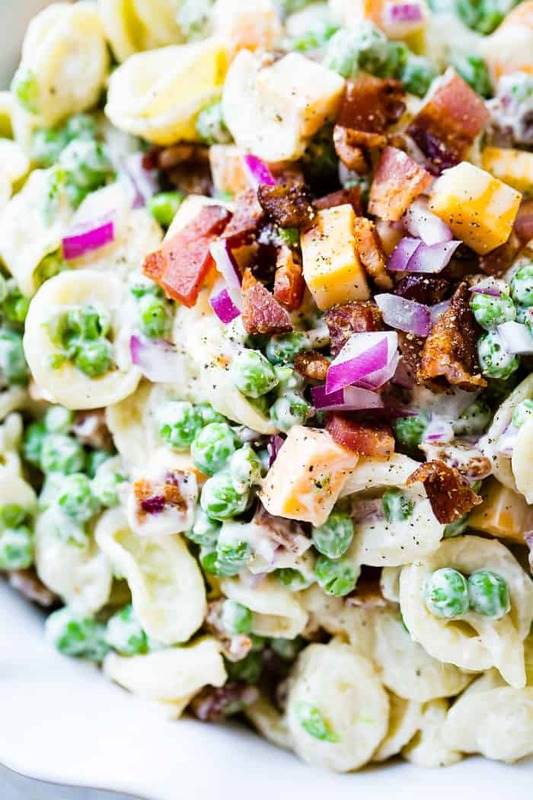 Bust out a creamy, delicious Easy Southern English Pea Pasta Salad and suddenly the food is what everyone is talking about. It’s tradition to bring a good pasta salad to a gathering, so make sure it’s a good one! I still remember the first pasta salad I ever had. I believe it was called, Suddenly Salad and it came from a box. It was not as awesome as Easy Southern English Pea Pasta Salad. I don’t remember where I was or who was making it, but I remember this woman opening the box, making the pasta and whisking up the dressing. There was a small can of olives which she added to the pasta and stirred it all together. I’m not proud to say that I was young and quite vividly remember picking out the little bits of celery and peppers, but at least I ate the black olives, right?! I mean, that totally counts for something! There’s another recipe for an easy pea pasta salad on our site that you might enjoy as well, but this one, ohhhh this one is totally our favorite this year. It’s just so simple and quick to make. As in, totally under 20 minutes to make it. Don’t skip it completely though. 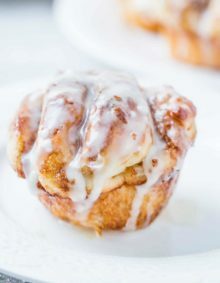 It’s a fantastic recipe that I know you’ll absolutely love. It’s full of cucumbers, peppers etc, so it’s even more filling and absolutely a recipe you should try out on your family. Actually, now that I’m thinking about it, we’ve been making pasta salad in a lot of different flavor profiles, Italian, Greek, Teriyaki Chicken Pasta Salad, Southwest Pasta Salad and even a California Club Pasta Salad. We totally know what we are talking about. 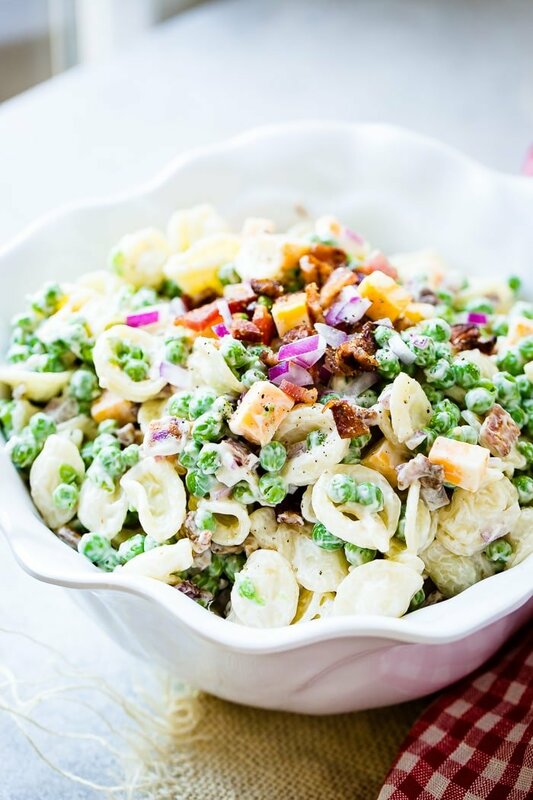 Our Southern English Pea Salad Recipe is what this recipe for Southern English Pea Pasta Salad is based off of. Obviously we encourage you to start with that. 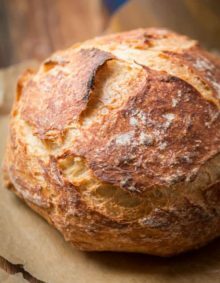 It’s always best to start with the recipe that inspired others so that you can truly enjoy and appreciate the starting base. But then quickly move on to your Southern English Pea Pasta Salad because, folks it’s just that good. 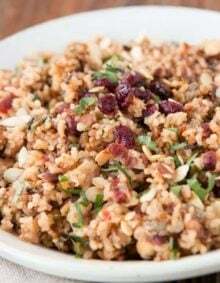 There are a few pasta shapes that we personally believe are better for pasta salad recipes. Stick with dried pasta instead of fresh pasta as it will hold up better. You can use any kind of pasta you want, but Cade made a good discovery that when you buy orchiette pasta, the peas, bacon and other ingredients nestle up in each pasta “ear” if you will and it’s like the perfect bite every single time. I know you know what I’m talking about. You order a big salad at a restaurant and stab each ingredient, the spinach, the berries, a brown sugar almond and take the most perfect bite, yeah that’s exactly what it’s like without ever trying. When making a cold pasta salad you should always rinse the pasta. Rinsing the pasta allows it to cool more quickly which is essential for a cold pasta salad recipe. The best tip for pasta salad is in the cooking and dressing. Cook the pasta until past al dente, but not mushy. There won’t be a warm sauce over it, so you’ll want to take it a step further in the cooking process. Dress the pasta salad when it’s ALMOST cooled completely with 2/3 of the sauce, then right before serving, add the final bit of sauce. Dressing in this way will allow the dressing to marinate the pasta if you will, then the final dressing sits on top and gives that extra oomph of flavor! 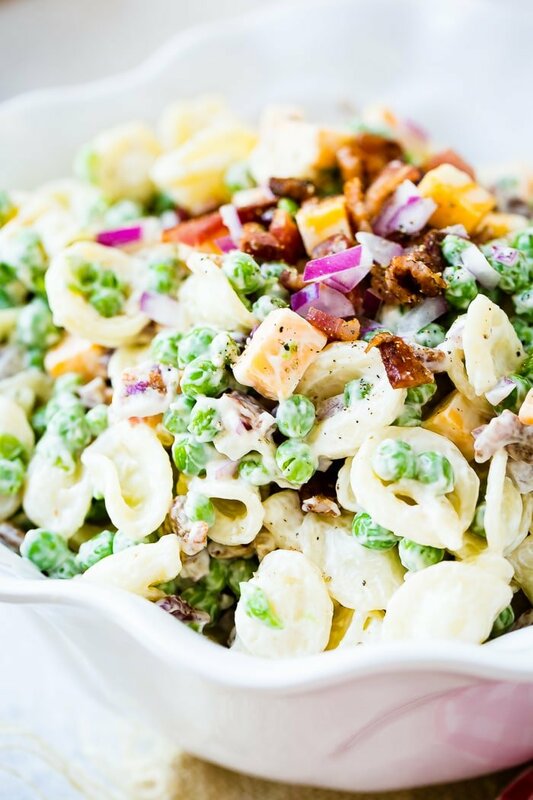 We can’t wait for you to try this Southern English Pea Pasta Salad! If you do, please tag us on social media, @ohsweetbasil #ohsweetbasil and tell us if you make any changes! 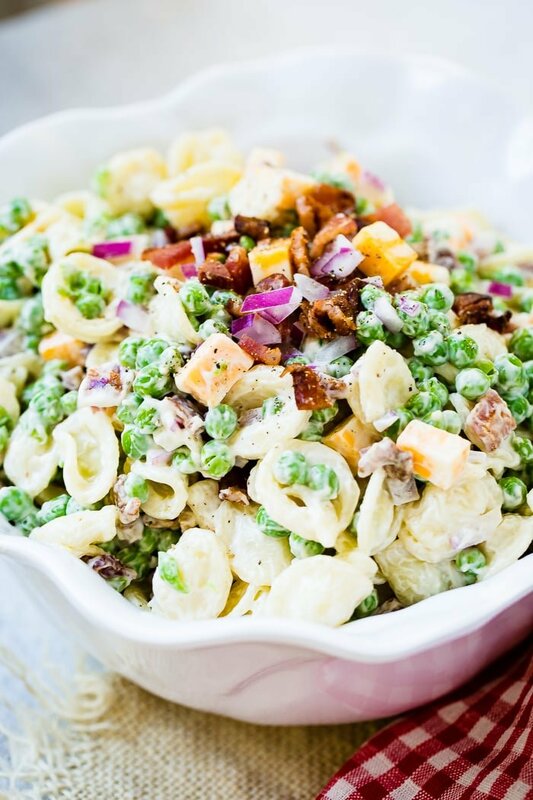 Looking for a few different pasta salad recipes other than our Southern English Pea Pasta Salad? Here’s just a few to get you started: Mango Chicken Pasta Salad (one of my all time favorites!) , Easy Italian Pasta Salad, Easy Greek Pasta Salad, Easy Pea Pasta Salad, Teriyaki Chicken Pasta Salad, Southwest Pasta Salad, Easy Bacon Chicken Ranch Pasta Salad, California Club Pasta Salad, Pizza Pasta Salad, 10 Minute Ranch Tortellini Pasta Salad, and finally, Bowtie Chicken Pasta Salad. In a skillet over medium heat, add the bacon and cook until crisp, turning once to cook on both sides. Once cool, chop the bacon into small pieces. Heavily salt the water until it tastes like salt water. Add the pasta and cook until just past al dente. Rinse with cool water and set aside. The pasta should be just barely warm. In a large bowl, whisk together the mayonnaise, vinegar and a pinch of salt. Use 2/3 of the dressing on the pasta, set aside the rest. Add the partially defrosted peas, red onion, eggs if desired, cheese and stir to combine. Right before serving add the remaining of the dressing. Add the bacon and season with salt and pepper if needed. This looks soooo amazing! It’s been forever since I’ve had this so I need to add it to me menu plan!